After losing his best friend Charlie on Christmas Eve, young Bobby (Kristian Jackson) struggles to hold onto his joyful spirit. 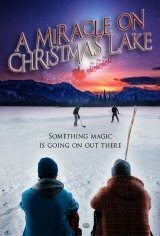 One night, while shoveling the icy lake on which he and Charlie used to play countless hockey games, he discovers a magical, perfectly groomed hockey rink that only appears at night and only in his presence. But when a construction company purchases the land for development, Bobby and his friends must rally to save the rink, a mission that finally gives Bobby something to hold onto.